District 65 Attendance Area Map as of Sept. 1, 1967. I came across a short video earlier this week on the WTTW site. It appears the video is set not to repost or download, so go to the link to view it. Really, take the time. It is an excerpt from a longer documentary on school desegregation in my home town, Evanston, Illinois. I’m going to be working to find the whole show. Evanston was one of the early sites for “affirmative desegregation,” done to overcome def facto segregation and not under legal compulsion. I was part of the first Headstart and Kindergarten classes to integrate Foster School, featured in the video. That’s my kindergarten teacher, Mrs Todd (this must be the afternoon class, because I’m not there and neither are my classmates) and Robin Moran (interviewed) was a family friend. 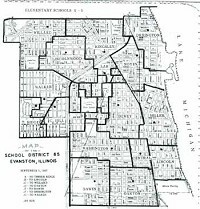 The desegregation/integration in Evanston was done largely via a Magnet School plan and there were and are problems. To read more about the history, see this write-up of a session on the topic I did some years ago for the History of Education Society and this series from the Evanston RoundTable and this from the Chicago Reporter and check out ShoreFront (these take you up to about 2002, the Roundtable Archives are a good way to catch up from there). In case you were wondering, that’s where I come from, geographical, ideologically and educationally. Aha! Just found your blog via Larry Davies’ blog. The afternoon class. That explains it. I was in the morning class with you (right?) I see you’re doing great things for Madison. Another great legacy to honor our roots.